Yes, you can have an amazing plate of pasta and, if it’s season a bright and angular salad of escarole, fava beans, pecorino, mint and basil, and leave Via Carota completely sated. But if you did you’d be missing out on what could be the best chocolate cake, and a flourless one at that, ever. With just enough sweetness to counter and enhance the depth of its rich chocolate, this cake is light, crumbly and moist (yes, I know, that can be a difficult word) while avoiding the density often afflicting flourless bakes. Seriously, the best chocolate cake, flour-less or not, ever. Open daily for from 11a.m. 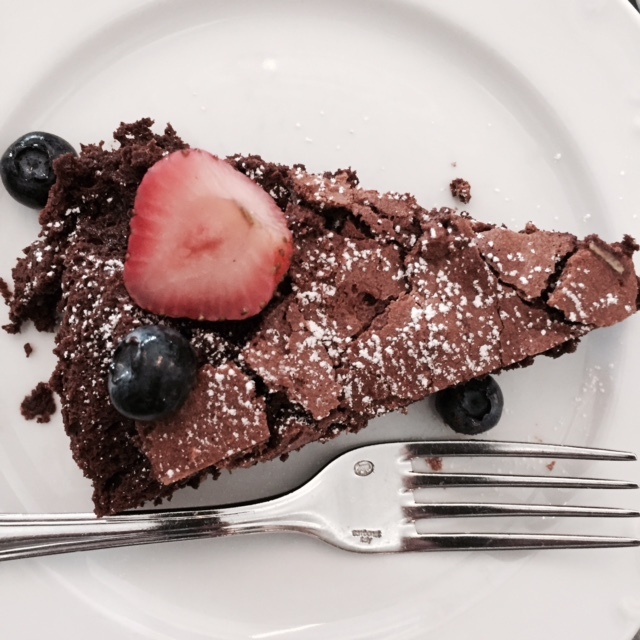 to midnight for lunch, dinner, drinks, and, of course, the torta al cioccolato. Via Carota, 51 Grove Street, NYC. No reservations accepted.